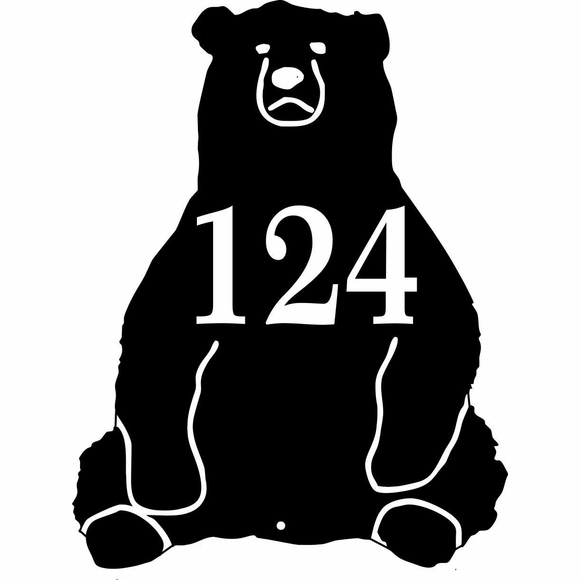 Sitting Bear Shape House Number Plaque - - wall mount sitting bear address plaque displays the house number you supply. If your home or business is located in bear country or you're a city dweller with a soft spot for bears, then this sitting bear silhouette sign is the one you want for your building. Made in USA. Wall mount 9"W x 12"H bear can hold one line of personalization with up to two (2) 3" characters or three (3) 2.5� characters (typically the house number). Customized with your choice of color and the address number you specify. Bear's features are the same color as the address number. Characters are permanently engraved into the sign during the production process, never printed, silk screened, or painted on. Dimensions: 9"W x 12"H x 1/8". Contact customer service for quotes on sitting bears up to 23" high.